Is there anything sweeter in life than taking a stroll through beautiful gardens? If you feel overwhelmed by your everyday routine and wish to return to simpler pleasures you need to visit beautiful Mississippi botanical gardens? There are three near Jackson that can make for the perfect romantic activity if you’re traveling with the love of your life. Read on to learn more about our three favorite gardens and start planning your visit today! Make sure you also download our free Vacation Guide; it features all of our favorite local restaurants, events, shops, museums, outdoor adventures, and more. The Garden of Mynelle Hayward is the first stop on your quest to find the best Mississippi botanical garden and lucky for you, it’s at the heart of Jackson! This beautiful green patch in the city began as a flower shop in the 1920s and has gradually grown into the color-rich garden that visitors marvel today. Picture yourself exploring this 7-acre paradise and spend the afternoon relaxing in the sun. You can also bring a book and read in the shade on one of the benches! Although the warm weather allows for green grass and colorful flora year-round, we recommend visiting between February and November. This is when the gardens are open for tours! Leave the city for an afternoon and drive North to the splendid Reservoir Botanical Gardens. It’s a great destination if you wish to hike and discover Mississippi’s unique ecosystems. Follow the 0.62-mile trail along the wooded area and banks of Mill Creek. You’ll discover colorful flowers and native plants! Continue your journey north and head to Wister Gardens! The 14-acres of lush vegetation is about an hour and a half away from Jackson, and will make you feel as if you stepped into a real fairytale. The gardens were designed in the 1930s by Frances Chiles Henry and Wister Henry. They still amaze locals and visitors alike today! Marvel at the hundreds of Azaleas, roses, Daylilies, crepe myrtles, and let their vibrant colors enchant you! You can explore the various pathways that wind through wooded areas. Rest in the shade in the gazebo, get a refreshing breeze near the Italian fountain, and enjoy the sweet and soft pace of life of this authentic Mississippi colonial property. Tip: The gardens are handicap-accessible and admission is free. Pursue the ultimate Southern escape at our lovely inn in downtown Jackson! 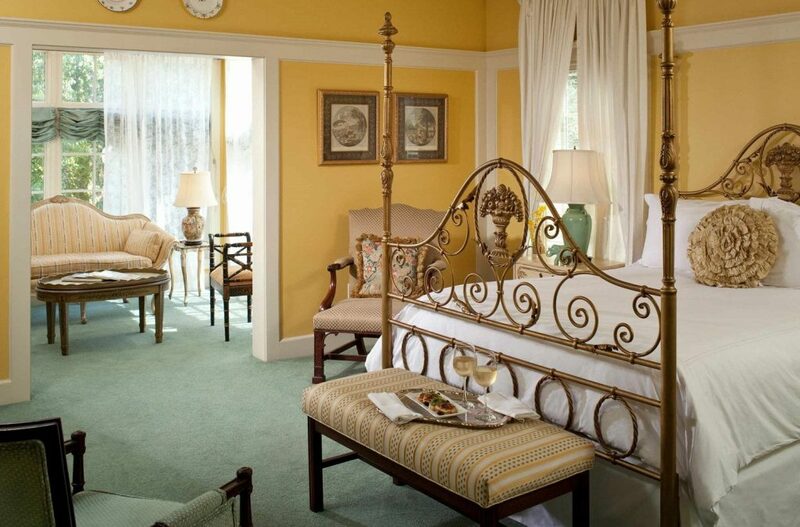 The Fairview Inn is a historic boutique hotel that will take you back in time. Enjoy the Mississippi charm of our 1908 building, its elegant white columns, and its lush gardens. You can relax outside with a cup of hot tea or a glass of wine and relax to the sound of buzzing bees. After spending the day roaming around gorgeous botanical gardens, come home to your cozy and elegant room! Our accommodations are some of the most stunning in town, and when you see them, you’ll understand why! Take a look at the Spanish Suite. Its yellow tones and delicate decor inspired by the early 1900s will give you the peace and serenity you seek. You can snuggle up with a good book in the sunroom, treat yourself to a hot bath in the whirlpool tub, and wake up to the sound of chirping birds right outside your window. We have a feeling you’ll love the garden view!